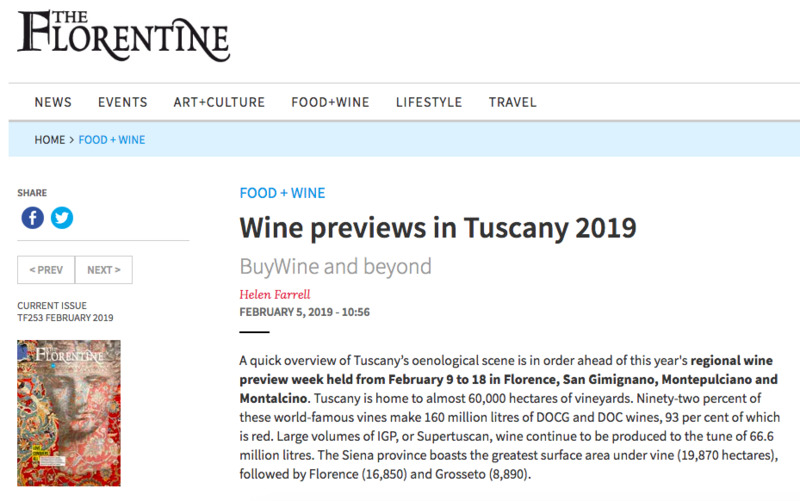 A quick overview of Tuscany’s oenological scene is in order ahead of this year's regional wine preview week held from February 9 to 18 in Florence, San Gimignano, Montepulciano and Montalcino. 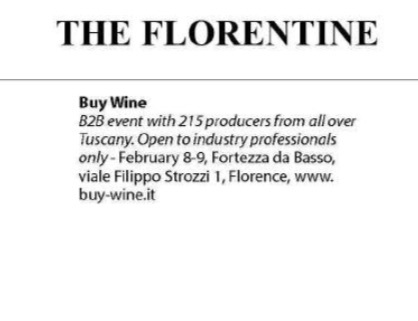 And yet the production of high quality wines was so deeply rooted in these territories that Cosimo III de’ Medici in 1716 realized the need of protecting Tuscan wines of Chianti, Pomino, Carmignano and indeed Valdarno di Sopra, from forgeries. Etruscans were already making wine in the 4th century BC. In the 1st century Plinio the Elder mentions the lands surrounding Arezzo as the best for winegrowing and refers to the numerous grape varietals here cultivated. In middle ages it’s thanks to monks if grape cultivation is protected from theft and devastation. 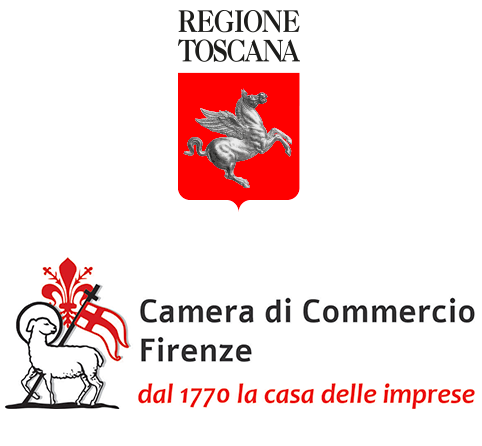 The Florentine cadastre of 1427 mentions, besides the technical cadastral quotes, the value of the products obtained in different areas, ranking in fact by merit and price, the wines of the time. During the agricultural transformations that took place between the 16th and 18th century the first specialized vineyards are grown and viticulture is developed with a more scientific and entrepreneurial attitude. During the 19th and 20th century, wines produced in Valdarno di Sopra were progressively grouped under the Chianti name, initially in a generic way and then in the sub-zone Colli Aretini. The same happened with Carmignano, re-born with its proper name only in the 60’s and with Pomino where it was decided to distinguish their wines under thed Chianti Rufina denomination. For the wines made in Valdarno di Sopra the association with Chianti wasn’t doing justice to the complexity of local productions. Many “Supertuscan”, acquiring a well known reputation among insiders, were made with the grapes grown in this area. We are talking of wines made not only with native grapes varietals, mainly pure Sangiovese and also Pugnitello, Foglia Tonda or white Malvasia, but also from foreign grapes like Merlot, Syrah and Cabernet Sauvignon that had little or nothing to share with the Chianti disciplinary. We are located in the Eastern and Western slopes of the valley of river Arno (Val d’Arno) between the Arezzo plain and the Florentine hills. Climate conditions are certainly favorable to grape growing and the area is classified as intermediate in the Rocchi scale. The Appennine area of central Tuscany is under the influence of a temperate cold climate but is affected, especially in the summer, by the Mediterranean climate which positively determines the end of the growing cycle allowing a complete and progressive maturation avoiding harmful extreme conditions. With the 13th June 2011 Ministerial Decree, this forerunner delimitation of origin is institutionalized with the “Denominazione di Origina Controllata” attribution to the wines of the “Val d’Arno di Sopra” or “Valdarno di Sopra”. Actually already in 2005 the wines of Pietraviva were made into a DOC that has now been included in the new Valdarno di Sopra that recognizes two sub-zones, Pietraviva and Pratomagno. The disciplinary has been then modified and adjusted to the OCM European laws as DOP wine with the 07.03.2014 Ministerial Decree. In the Valdarno di Sopra DOC the following wine types can be made: White, White Spumante, Rosè, Rosè Spumante, Red. Among grape varietals, the following can be specified: Chardonnay, Sauvignon, Cabernet Sauvignon, Cabernet Franc, Merlot, Sangiovese, Syrah. 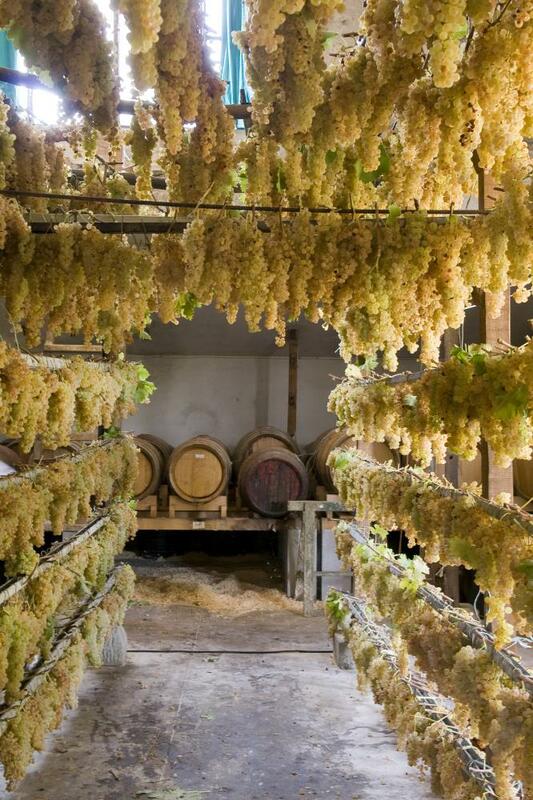 A kind of passito wine can also be made from white grapes. The production area covers the municipalities of Cavriglia, Montevarchi, Bucine, Pergine Valdarno, Civitella in Val di Chiana, Castelfranco-Pian di Scò, Castiglion Fibocchi, Terranuova Bracciolini, Loro Ciuffenna, San Giovanni. The area of production of the grapes destined for the D.O.C. Montecarlo includes in Tuscany part of the territories of the Municipalities of Montecarlo, Altopascio, Capannori and Porcari in the Province of Lucca. The territory is homogeneous with good rainfall, rich in mineral elements and organic substance, characterized by a great hilly morphological uniformity. The area is bounded on the southwest by the plain of Lucca and by the former lake of Bientina, to the north east of the Pizzorne massif and the Pescia plain. 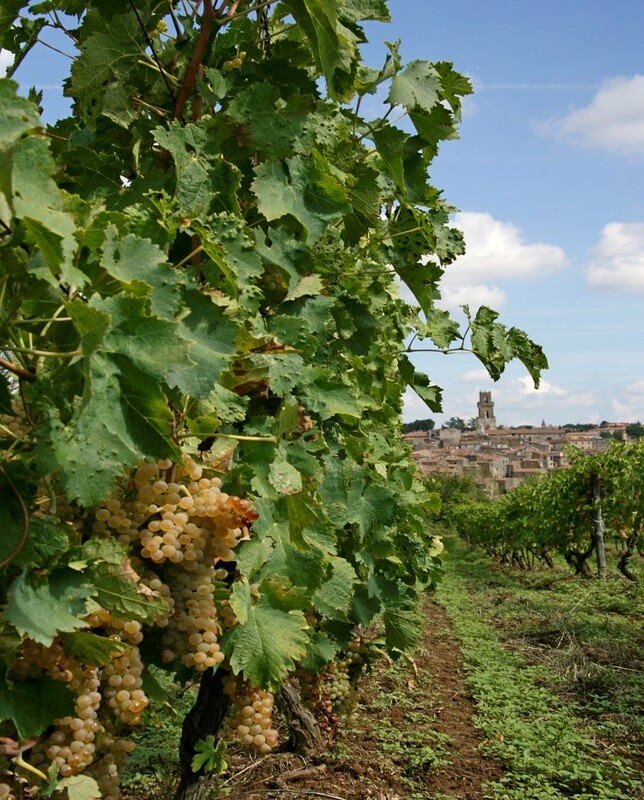 The history of the village of Montecarlo is intertwined with that of its wine. 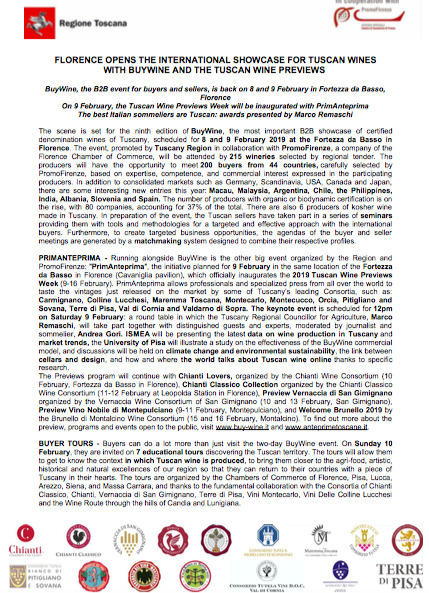 The area of production of “DOC Bianco di Pitigliano” and of the “DOC Sovana” falls in the southern part of the Tuscan region, in the province of Grosseto, in a hilly territory wich includes the municipalities of Pitigliano, Sorano and part of Manciano and Scansano. The area has a volcanic origin and its altitude avarage is 310 meters above sea level.A Mediterranean type is the climate of the area, with mild temperatures and precipitations especially concentrated in the autumn-winter months. There are clear testament to the cultivation of vite in the territory dating back to the Etruscan, Greek and Roman periods. This millenary wine history is proof of how man has handed down over the centuries the traditional techniques of vite cultivation and enological practices, which in modern times have been improved thanks to scientific and technological progress. From all of these reasons derive the peculiar characteristics of the wines of the area. 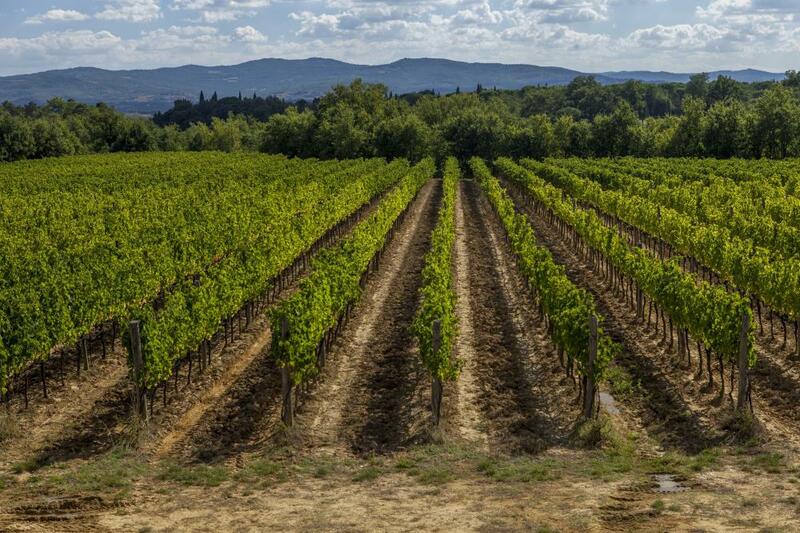 The wine production in the Terre di Pisa dates back to the Etruscans who inhabited that land which is present-day the Tuscan coast and who cultivated vines. From the Renaissance onwards, over the centuries, there are numerous documents talking about the wine of the Pisan hills as a product of established quality, well known beyond the local geographical boundaries: thanks to Pisan wine merchants who travelled around the ancient known world and to the foreign policy of Medici family. In 1885 took place the first Wine and Olive Oil fair of Pisa, testifying the growing will of the territory to create its own well-defined identity. 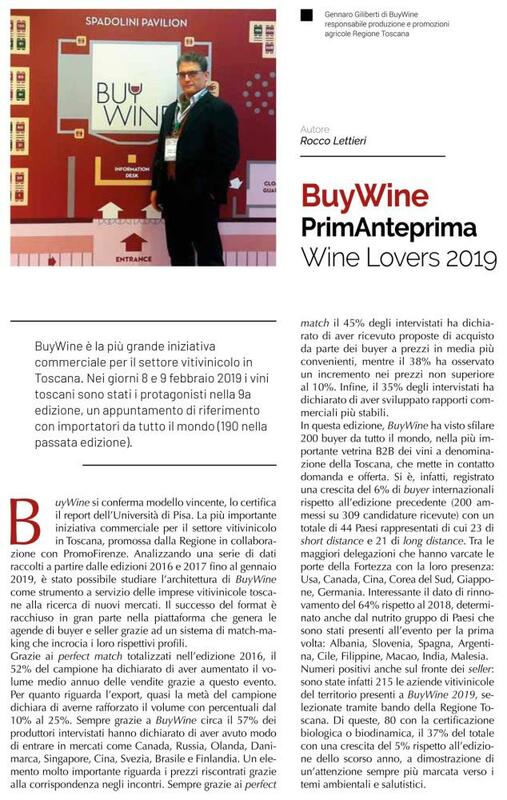 In late 2018 Consorzio Vini Terre di Pisa is finally born with the aim of protecting and promoting the high quality wine production which, along these last 20 years, has given proof to be very lively and true expression of Terre di Pisa territory: from the hills to the sea, in a Tuscany that you do not expect. TERRE DI PISA D.O.C. 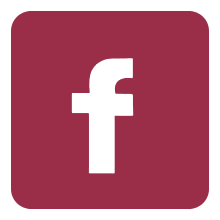 was born in 2011 to represent the best of Terre di Pisa wine production based in the municipalities of Fauglia, Crespina, Lari, Chianni, Capannoni, Palaia, Peccioli, Terricciola, Casciana Terme, Ponsacco, Pontedera, Montopoli VA , San Miniato, Orciano Pisano, Lorenzana and Santa Luce. It is characterized by a predominantly hilly landscape, where the presence of the vine is inserted and integrated into a unique ecosystem, in which the vineyards alternate with woods, olive groves and arable land ideal for a mainly organic viticulture. TERRE DI PISA rosso which can represent wines with Sangiovese, Cabernet Sauvignon, Merlot and Syrah alone or jointly, minimum 70%. Cortona, from its 585m a.s.l., is still overlooking today, as it has always done, the vast and harmonious panorama of Valdichiana, dotted with villas and farmhouses amidst rows of orderly vineyards bearing testimony to the ancient excellence of its wines. And as Plinio Junior spoke of an esteemed white wine known by the name of Etasiaca, the food loving and connoisseur Rennaissance Pope Paul III loved to stock up on the products of these vineyards, whereas Giosuè Carducci often found inspiration for his poetry in front of a barrel of the “splendid wine” of Cortona. The geological origin of this territory is essentially referable to the inferior Miocenic, superior Pliocenic and Miocenic periods; its lithology is distinguished by sandstones, marl and schist, with presence of fluvial deposits, clay and detritus of stratum. A DoC that Contain the oenological richness of the terrItory. 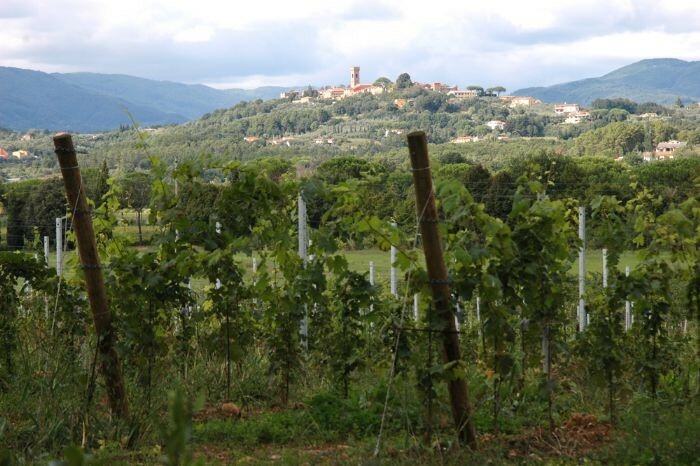 The production area of the grapes used in the production of Doc wines “Cortona” falls in the province of Arezzo and includes the land – part of the administrative area of the City Council of Cortona – dedicated to quality. Three hundred hectares are employed in the production of the Doc today, but the area has more potential and it’s bound to be expanded. About one million bottles a year bearing the label “Cortona Doc” are produced every year, a broad controlled denomination of origin, dominated by Syrah, Merlot and Sangiovese. 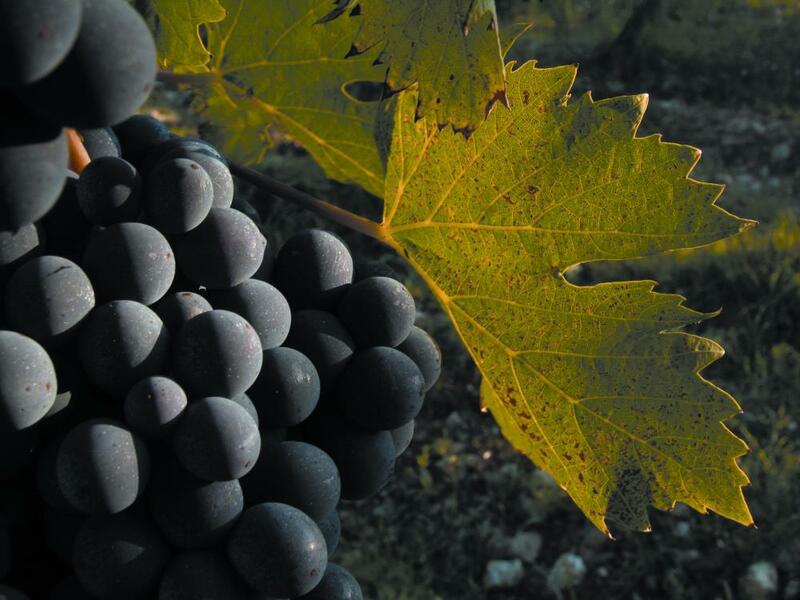 A taste which is fresh, decisive, elegant and powerful: this is the result when summing up the main features of the Syrah wines of “Cortona Doc”. A variety of grapes that found the ideal environment and climate on the hills surrounding Cortona. The legend that ties these grapes of supposedly middle – eastern origin (from the Persian city of Syrah) or Mediterranean (from Siracusa) or French (in more modern times) tells us of some vine shoots that had been left following the French occupation under Napoleon. The microclimate, the quality of the soil, the harmonious effects of wind and sunshine, in this eastern part of Tuscany, have allowed their perfect marriage to this territory achieving today’s expressiveness. The consortium vini Cortona was set up in the spring of year 2000. 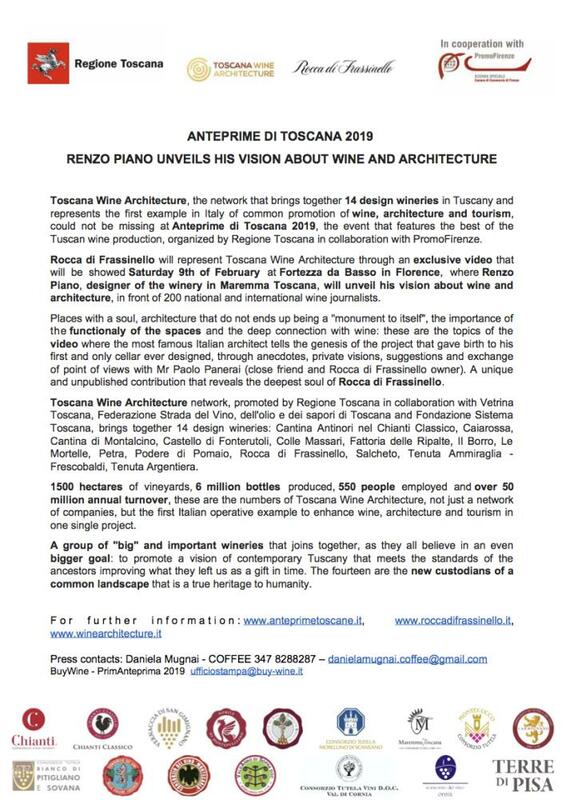 Its function is to act as the organisation that exercises control and protection of the “Cortona Doc” wines, as well as promoting its brand through effective cultural activities. 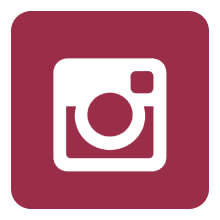 It protects the image and the prestige of the denomination through continuous quality checks and it promotes initiatives aimed at advertising Cortona, its territory and wines, throughout the world. There are 31 businesses currently associated to the consortium, and they represent the near totality of the producers. Among them some known brands, born and rooted in the territory, others of more recent origin and a few of international resonance. It is flattering that these last few years have so given credit to the territory of Cortona that has seen important investments as a result. The environment, the natural suitability of the location and the soil, as well as the tradition and culture of wine making have brought about grape and wine production of a very high standard, hence wines of very high quality. 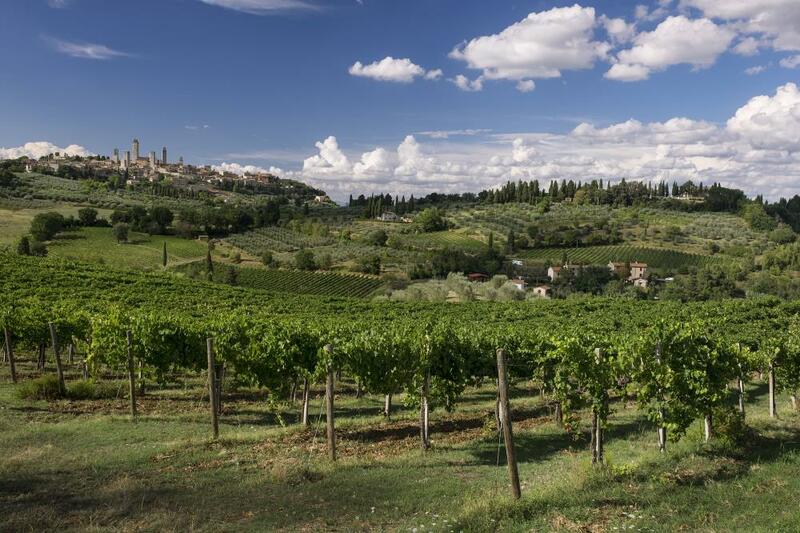 Orcia, a great wine produced in the heart of Tuscany, in the hills where the farmers' work over thousands of years has created a wonderful landscape. A land of artistic craftsmanship and excellent foods such as Doc Orcia wine, extra virgin olive oil, white truffles, cold cuts, saffron, open range farming of the ancient breed of “Cinta Senese” pigs, Chianina cows also known as “ white giants” and loved by the ancient Romans, and sheep for the production of pecorino cheese. The appellation Orcia was born on 14th February 2000 and includes Orcia varieties obtained from red grapes with at least 60% of Sangiovese, and Orcia “Sangiovese” with at least 90% of these grapes, both in the “Riserva” version too. 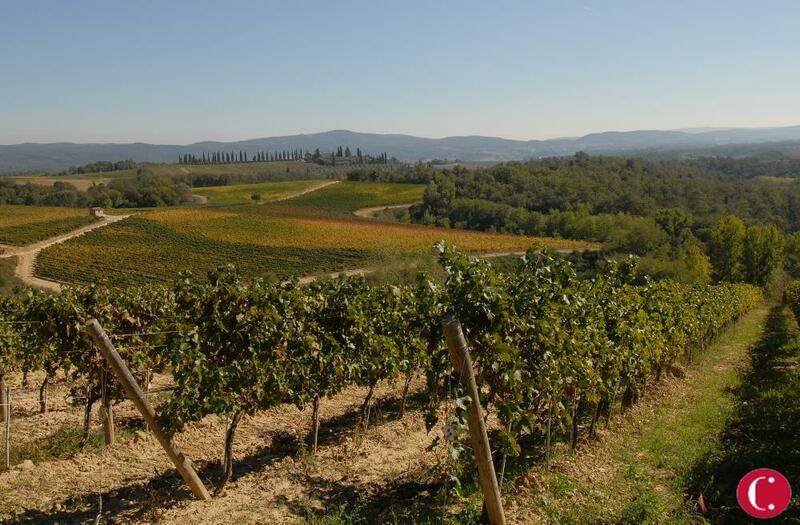 The appellation Orcia also includes White, Rosé and Vin Santo wines. These wines are the expression of the commitment and passion of the producers, most of whom do everything themselves, from working in the vineyard to selling the bottled wine. In an era of globalization, Orcia wine is still a family product, produced by those who live in the vineyards, respecting nature and having excellent enology and viticulture skills. Orcia wine is produced on the hills in southern Tuscany, more precisely in 13 municipalities: Buonconvento, Castiglione d’Orcia, Pienza, Radicofani, San Giovanni d’Asso, San Quirico d’Orcia, Trequanda and a part of the Abbadia San Salvatore territory, Chianciano Terme, Montalcino, San Casciano dei Bagni, Sarteano and Torrita di Siena. The Doc Orcia wine territory was already populated in Etruscan and Roman times when the Cassia route crossed the region and castrum (castles), villas and spas were built. In medieval times the same road became the Via Francigena which joined northern Europe to Rome. The intense passage of merchants, pilgrims and soldiers favoured the construction of small hospices, enriched small villages along the trail and made it necessary to build castles and fortresses in order to protect harvests (Grancie dell’Ospedale di Siena). In fact bandit attacks were frequent. Traces of this past are still visible today. The hilly nature of the ground facilitated the forming of scattered rural settlements and the growing of a variety of crops in small fields. Each farm reared its own pigs and sheep as well as cultivating cereals, olives, vineyards, fruit trees and vegetables. These elements continued to exist for centuries until the 1960s, when there was a massive exodus from the country. Tourism has been the driving force which has recuperated this land and its heritage of buildings. Today the 13 Val d’Orcia towns are among the most exclusive tourist destinations, thanks also to the presence of excellent thermal centres. The creation of the Doc Orcia coincided with a change in the climate that no longer experienced heavy spring frosts. In the past these events were very frequent and were the main obstacle for successful viticulture. After the constitution of the appellation, about 40 wineries were born or continued their original activity. The wine producing heritage too has increased considerably with the new specialized vineyards designed right from the beginning to produce high quality grapes. San Gimignano is located right in the heart of Tuscany. It has a marked vocation for winegrowing but, unlike the rest of the region, is specialised in the production of white wines. The most important wine made here is Vernaccia di San Gimignano Docg, a white, and the first Italian wine to be assigned DOC recognition in 1966, progressing to DOCG status in 1993. In actual fact, Vernaccia di San Gimignano is much older. No other Italian wine has such a long history. There are traces of the production of Vernaccia di San Gimignano starting from the thirteenth century and its vicissitudes merge with those of the town of San Gimignano. Production was important during the Middle Ages and Renaissance, but this was followed by a long and gradual decline, until the middle of the twentieth century, after which it began to pick up again, renewing its fame and enjoying new success. 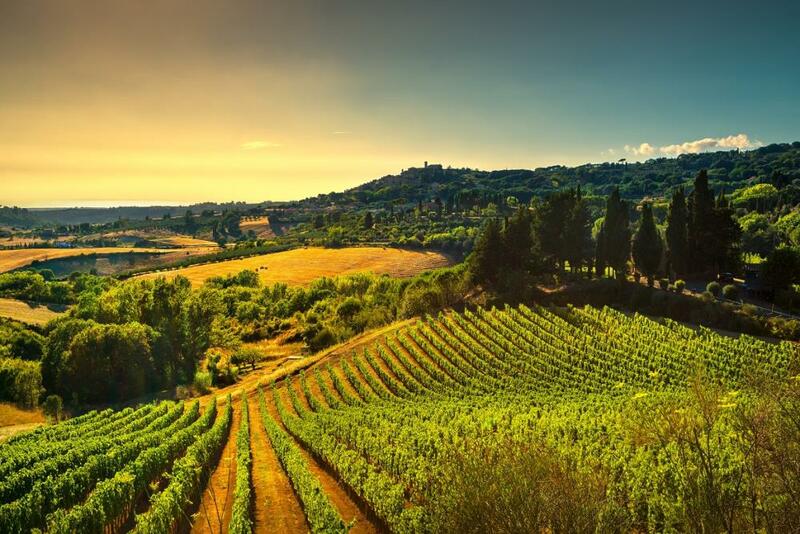 Centuries of winemaking production having moulded the territory of San Gimignano, making it one of the most beautiful areas in the region, with an alternation of vineyards and olive groves surrounded by woods and scattered with old farmhouses. The production areas included within the Appellations protected by the Consorzio della Denominazione San Gimignano, Vernaccia di San Gimignano docg and San Gimignano doc, fall entirely under the municipality of San Gimignano, which is in the northwest part of the province of Siena. It is an exclusively hilly territory, positioned between 200 and 500 metres above sea level. The soils date back to the Pliocene, 6.8 – 1.8 million years ago. In particular, those destined to the production of Vernaccia di San Gimignano are Pliocene marine deposits, made up of yellow sands and clay, rich in fossils, which represent the pedological element that characterises the taste of the wines. Consorzio della Denominazione San Gimignano was set up in 1972 for the correct management of the appellation Vernaccia di San Gimignano. San Gimignano doc was born in 1996: just like Vernaccia has been produced for centuries, red wines have been made on the same hills for centuries too. The first production regulations were formulated in that same year, with the dual intent of lending visibility and specificity to the red wines and Vinsanto produced in the area. The regulations underwent a full review in 2006 and then in 2011. The Vernaccia di San Gimignano production regulations indicate that the grapes can be grown and vinified exclusively in the municipal district of San Gimignano. The vineyards must contain at least 85% of Vernaccia di San Gimignano, with a maximum of 15% of other non-aromatic white grape varieties, suitable for cultivation in the Tuscany region. The use of Traminer, Muller Thurgau, Moscato Bianco, Malvasia di Candia, Malvasia Istriana and Incrocio Bruni 54 is not allowed. Sauvignon and Riesling can be used (individually or together) in a maximum of 10%. The yield must not exceed 9,000 kg per hectare. With the finest grapes selected, it is possible to obtain the Reserve version of the wine, which must spend at least 11 months in the cellar (in steel or wood) and at least three months in the bottle before being released for sale. Vernaccia di San Gimignano is a straw yellow wine with golden highlights which become more and more intense with age. The bouquet is fine and delicate, with fruity and floral scents when the wine is young. As it matures and ages, the characteristic mineral scent of flint develops. The flavour is dry, harmonious and savoury. The San Gimignano doc production regulations envisage the possibility to make nine different types of wine: six Reds (some Reserve), one Rosé and two types of Vinsanto. San Gimignano Consortium opened last April the new Vernaccia flagship center in the Montestaffoli Fortress, heart of San Gimignano and highest point in town, dominating the whole region of wine production. The San Gimignano Consortium opened its new Vernaccia flagship center in the Montestaffoli Fortress last April, heart of San Gimignano and highest point in town, dominating the whole region of wine production. “Vernaccia di San Gimignano Wine Experience. 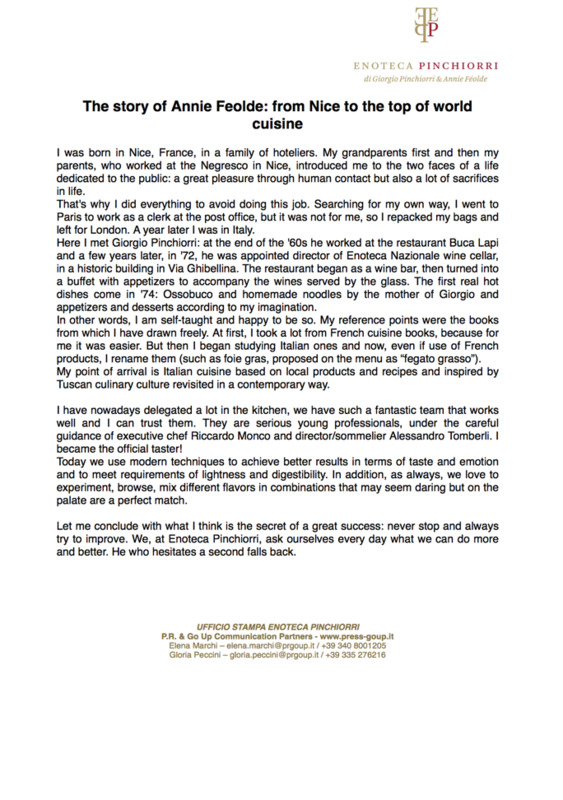 La Rocca” offers a full wine experience not only in the traditional tasting way, but on a deeper, more emotional level. The Maremma Toscana DOC wine is produced across the entire territory of the province of Grosseto, a vast area in the south of Tuscany that extends from the heights of Mount Amiata and, crossing the gentle hills of the Fiora, Albegna, and Ombrone river valleys, reaches the coast, Mount Argentario, and the island of Giglio. It then spreads north-west of the Ombrone River until the Colline Metallifere on the border of the provinces of Livorno, Pisa, and Siena. This extensive area is characterized by very different climatic conditions, which deeply influences the characteristics of the wine produced there, making the wine selection from this denomination extremely rich and varied. Unlike other Tuscan areas, with their overwhelming predominance of Sangiovese (regularly over 65% of the total number of vines), in the Maremma area this percentage decreases significantly, giving space to other varieties of vine, some of them traditional - like Alicante, Aleatico, Ciliegiolo, Canaiolo nero and Pugnitello among the red grapes varieties, and Ansonica, Grechetto, Malvasia bianca lunga, Trebbiano toscano and Vermentino among the white - and some of them international - such as Cabernet Sauvignon, Merlot, Syrah, Cabernet Franc, Petit Verdot, Chardonnay, Sauvignon and Viognier. This rich and varied heritage expresses itself in subtly different ways in the area and on its different types of soil. 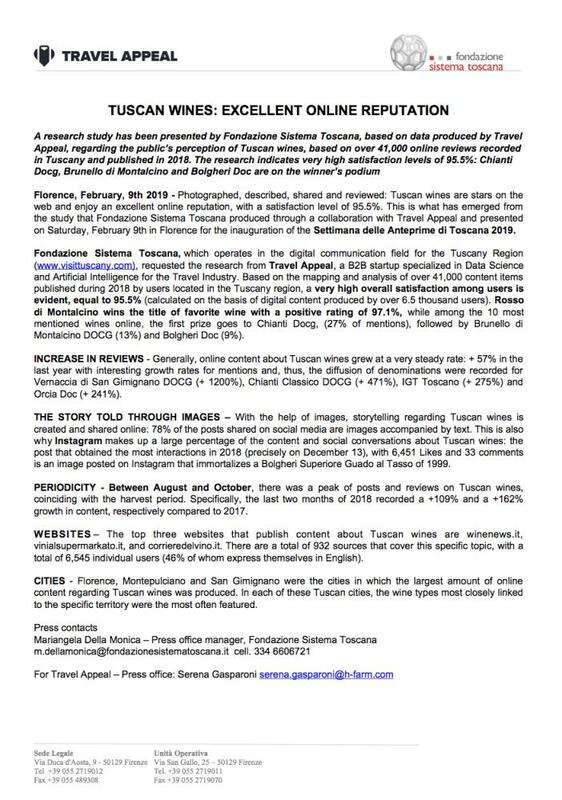 It is important then that a DOC, as an expression of an area like Maremma Toscana, assimilates this grand diversity of terroir and turns it into a tool that best allows producers to express themselves and offering a selection of versatile and multi-faceted wines that are nonetheless always linked to the Maremma area. 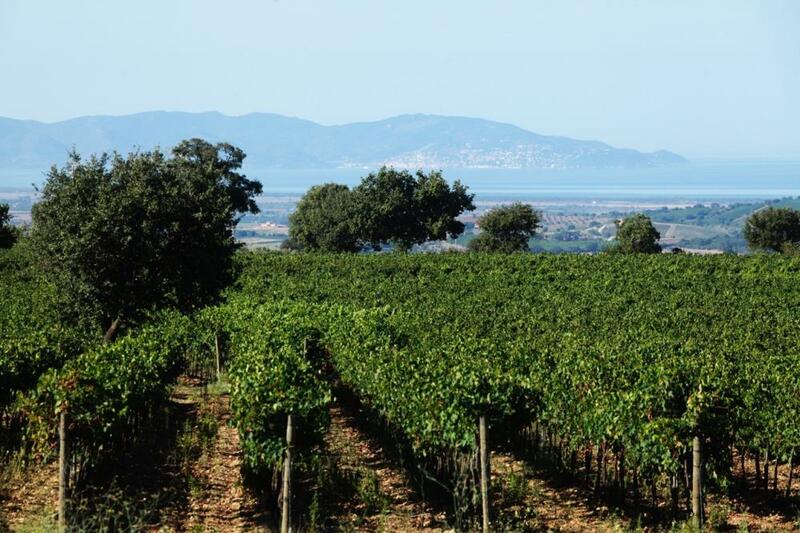 The Consortium of the Maremma Toscana Wines was founded in 2014 as a free association between wineproducers bent on safeguarding their wine and on accentuating its qualities. 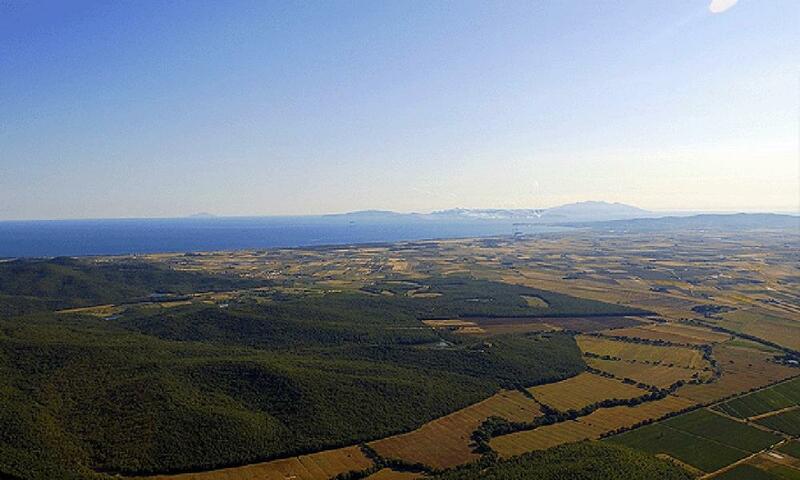 The Consortium safeguards controls and promotes all the wines of denomination Maremma Toscana. After two years in business already has 354 member companies - including 68 with "vertical production" - and a total of 4.5 million bottles produced and operates throughout the province of Grosseto, a vast and beautiful area in the south of Tuscany whose origins date back to Etruscan times, stretching from the slopes of Monte Amiata, and reachwww.consorziovinimaremma.ites the Tyrrhenian coast and the Argentario, to the island of Giglio. 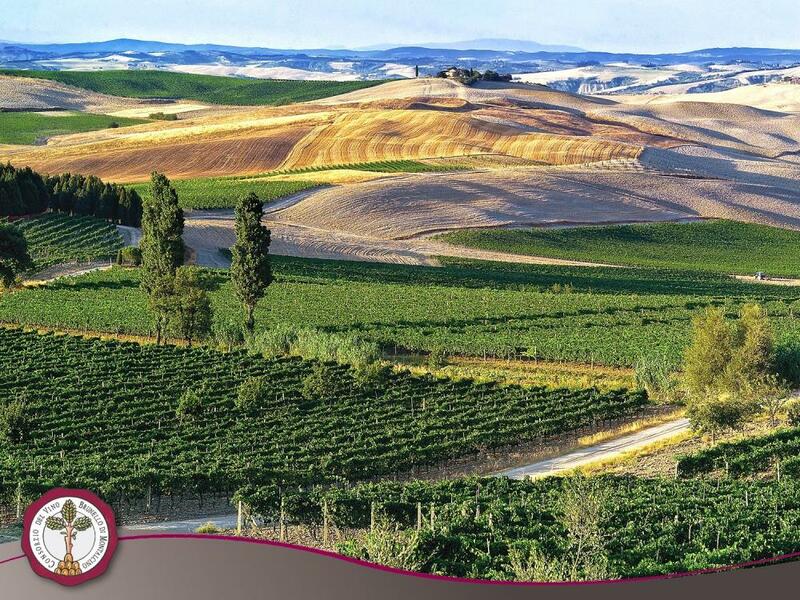 This area is characterized by different climate zones which deeply affect wine production all over the region. This aspect allow the Maremma Consortium to offer a wide range of different wines, each one with peculiar characteristics. vineyard to the church, and Repetti’s mention of a document in 1350 (in his “Historical and Geographical dictionary of Tuscany”) which drew up the terms for trade and exportation of Vino Nobile di Montepulciano. Sante Lancerio (1530), cellarman to Pope Paul III, defined Montepulciano’s wine as “vino perfectissimo” while Francesco Redi is famous for writing “Montepulciano d’ogni vino è Re” (“Montepulciano is of all wines the king”) in his “Bacco in Toscana” (1685). In his “Candide” (1759), Voltaire mentioned “maccheroni, Lombardy partridge and Montepulciano wine”. Recent research has shown that the official name of Vino Nobile di Montepulciano dates back to 1787, and was used in a “nota spese” (expenses account) by Giovan Filippo Neri (Governor of the Regio Ritiro di S. Girolamo, a historical Montepulciano institution) for a trip to Siena. The production area is limited to a small portion of land in the municipal area which is specifically suited to winegrowing, and the wine made here owes its quality to the geological features of the vineyards situated between 250m and 600m a.s.l. There are 1.300 hectares of vineyards registered for Vino Nobile di Montepulciano and about 550 for Rosso di Montepulciano. The Denominazione di Origine Controllata, or Controlled Designation of Origin: the Vino Nobile di Montepulciano DOC arrived on the market for the first time in the spring of 1966, one year after the inauguration of the Consorzi.. 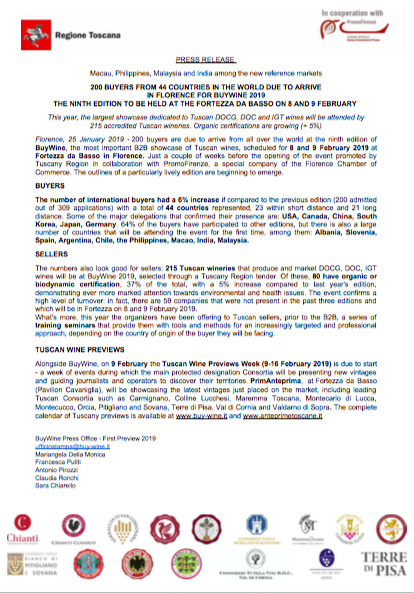 The prestigious Tuscan wine became one of the first ten wines in Italy to bear this new guarantee of quality. Fifty years have passed since that first milestone was reached, and the esteem the denomination is held in has only increased over that period. In 1980 the Vino Nobile di Montepulciano went on to become the first wine in Italy to be awarded the country’s highest recognition of quality: the DOCG. 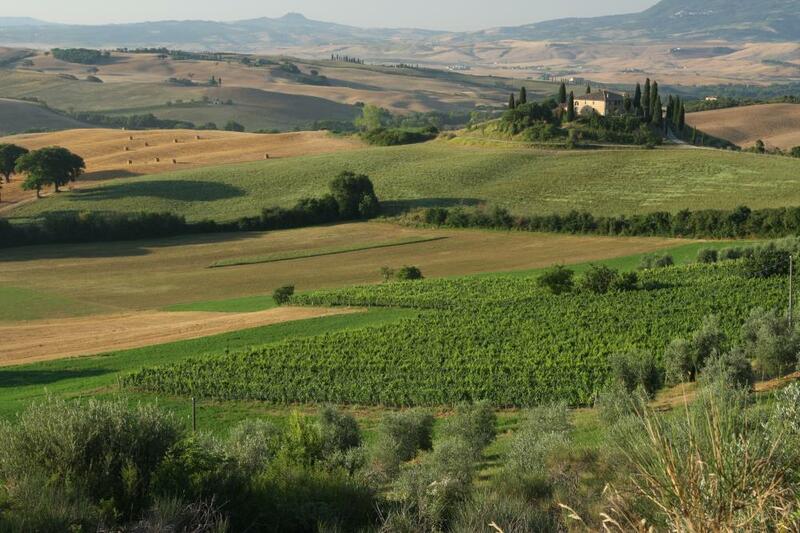 Montepulciano) in a minimum of 70% and it may be joined up to 30% by other varieties authorized for the Tuscany Region. 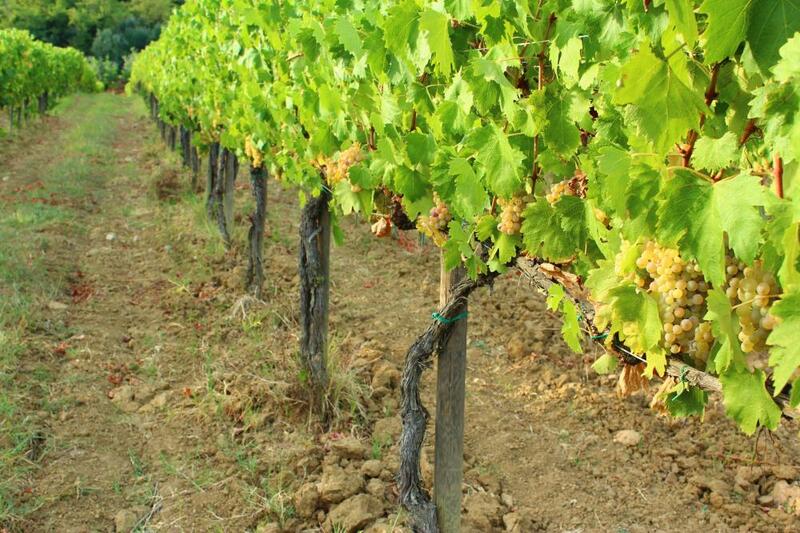 The maximum permitted yield per hectare is 80 quintals with an effective yield in wine of 70%. 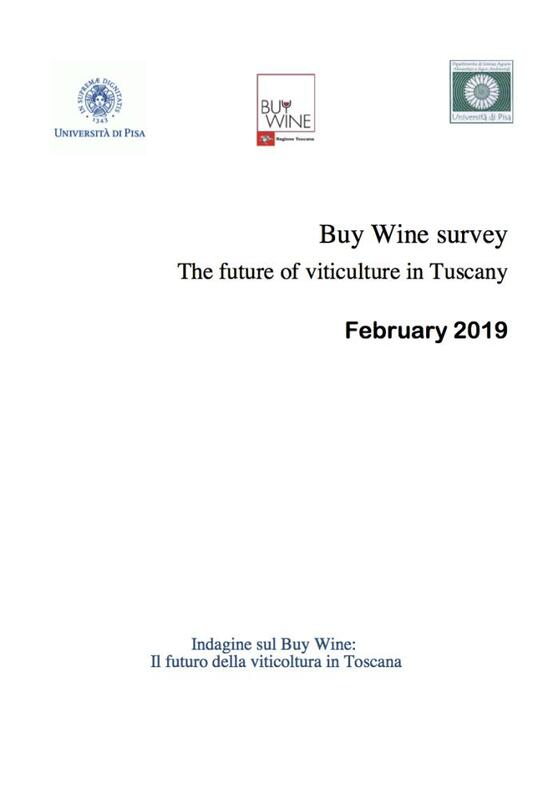 The wine can only be sold after ageing for two years (three for Riserva) after passing a series of chemical and organoleptic tests carried out by a ministerial board. Vinification and ageing must by law take place in themunicipal area of Montepulciano. The Consorzio del Vino Nobile di Montepulciano was founded in 1965 with the aim of protecting and promoting the image of Vino Nobile di Montepulciano (and later, Rosso di Montepulciano and Vin Santo) in Italy and the rest of the world. There are currently c.a. 270 members of the consortium (of which 76bottlers) representing almost the totality of the vineyards. The Consorzio also carries out the role of managing the appellation, of monitoring the wines on the market, of legal guardianship of the brand in Italy and around the world, of promoting and improving the whole appellation. 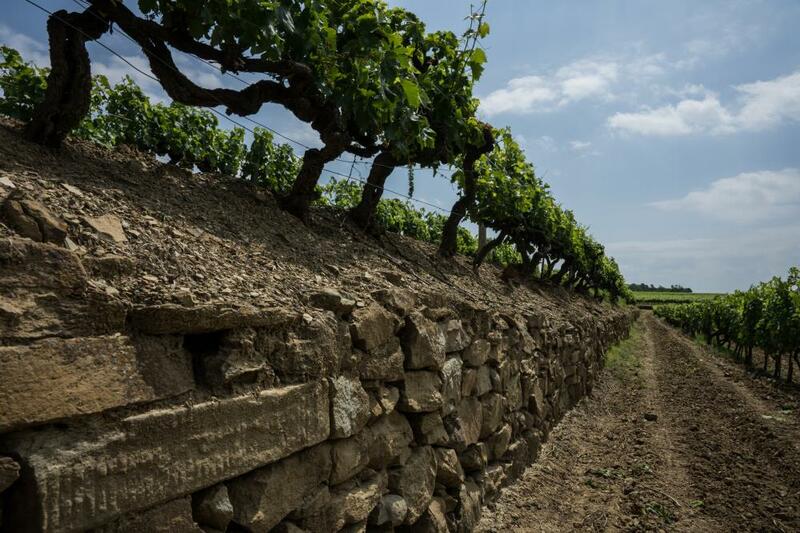 With the “erga omnes” legislation, the Agriculture, Food and Forestry Ministry made consortiums responsible for safeguarding, overseeing and promoting entire wine classifications. The statutory “erga omnes” (Latin for “towards all”) obligations were enforced by law in 2010, in line with the new EU OCM wine rules. The Consorzio del Vino Nobile di Montepulciano was been one of the first consortium in Italy to receive the Ministerial mandate, obliging all producers of DOCG Vino Nobile (including non-members) to contribute to the safeguarding, control and promotion of the classification. Montalcino lies in Tuscany, in central Italy, about forty kilometers South of the city of Siena, in the hill-lands of an uncontaminated landscape. A land of farms with an ancient history and of rare beauty which, since 2004, is enlisted among the locations of Heritage of mankind by Unesco. The territory of Montalcino consists of one tall hill, mostly covered by forests. 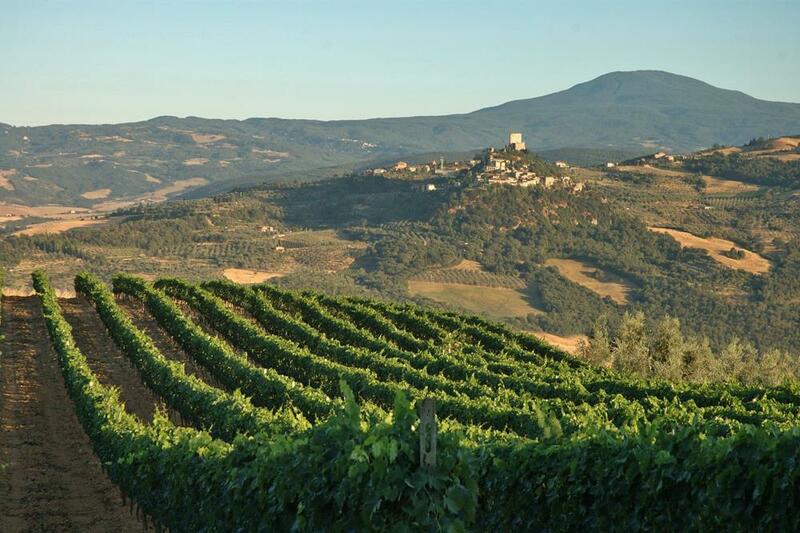 The origin of the name "Montalcino" is shrouded in mystery: some would have it that it comes from Mons Lucinus, the mount of Lucina in Latin, a mount named after the Roman goddess Lucina (the Greek Juno). Others, instead, link the name to Mons Ilcinus (Mount of the Lecci, the Italian for holm oaks) as an allusion to the diffused presence on the territory of holm oaks (ilex, ilicis in Latin), which is also the most widely accepted opinion. And, perhaps a fact that corroborates this theory, a holm oak is in clear view atop three mountains on the coat of arms of the Municipality of Montalcino. Between the 12th and 16th century, Montalcino was contended in fierce military battles, first waged against Siena and later, after 1260, allied with Siena against Florence. The small but bold town of Montalcino was thought to be an impenetrable stronghold, protected by walls and by a great fortress. 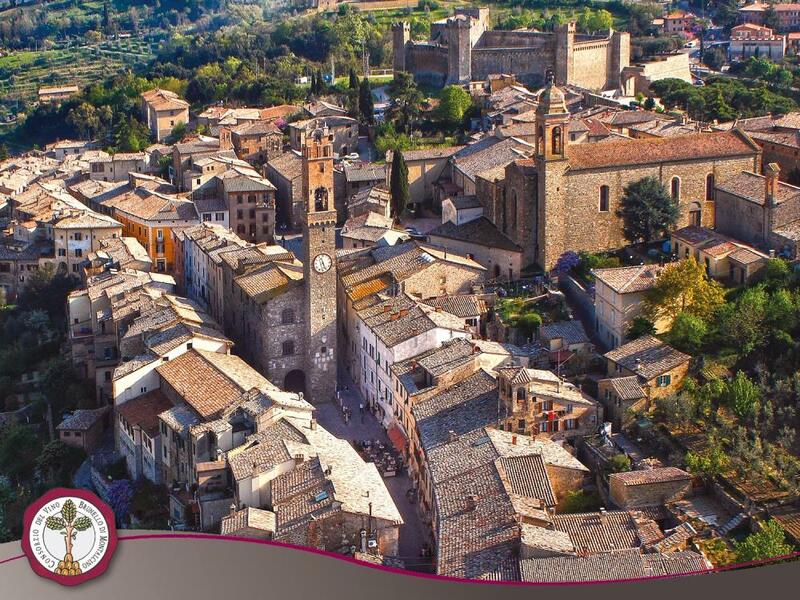 This is why, when the inhabitants of Montalcino handed over the keys of the city to the representatives of Cosimo de' Medici in 1559, the town had been the last to survive as an independent municipality in Italy. The territory of Montalcino has a natural vocation for the production of wines of the best quality, which has been renown for over two thousand years: evidence thereof and that Montalcino was a place where wine was made is given by the many archeological findings that date as far back as the Etruscan age. 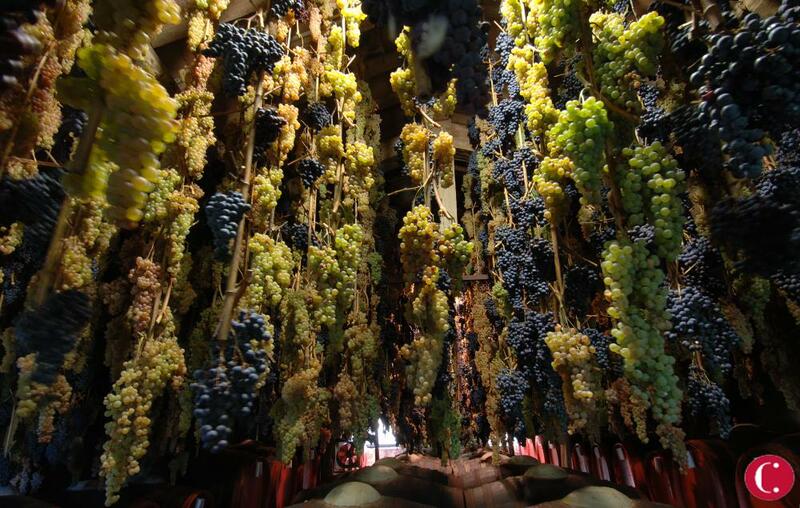 In the Middle Ages, municipal edicts established the time of year when grapes were to be harvested. 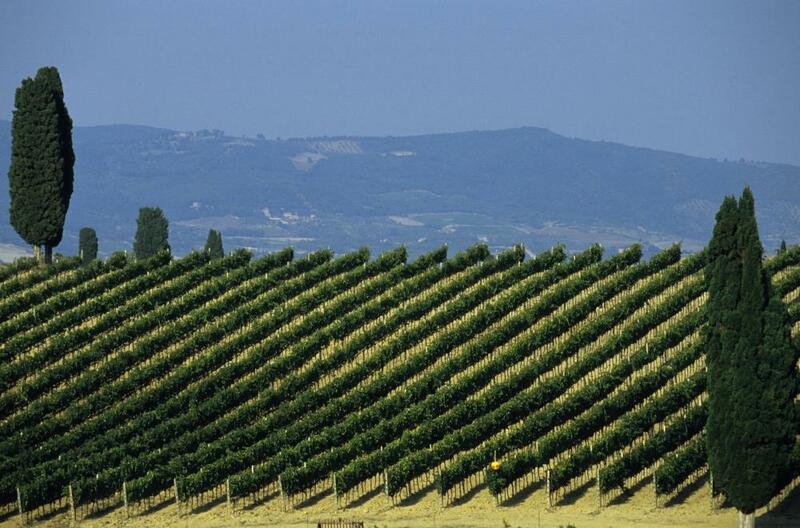 The area where the Montalcino wines are made lies within the confines of the Municipality of Montalcino. A district of 24,000 hectares, of which a mere 15% is occupied by vineyards. It is a pretty much squared area, the sides of which are bordered by the rivers Ombrone, Asso, and Orcia. The birth of the Brunello of Montalcino dates back to the 19th century, when a handful of local farmers begin to experiment making a red wine from grapes of a vine traditionally cultivated in the surrounding lands. A vine known as "Brunello" or "Brunellino", which around the middle of the 1800's is identified as a variety of the Sangiovese grape. For several years, the Brunello remained a rare wine reserved to only few refined connoisseurs. Only in the second half of the 20th century did it change from being an exquisite delicacy available to elite members to becoming a universal symbol worldwide of the finest Made in Italy. With the introduction of the DOC quality brand (a guarantee of origin attributed to Italian wines), the Brunello is brought to the forefront and numbers amongst the first eight wines to which the "denominazione di origine" or "guarantee of origin" is conferred.In 1966, the Brunello of Montalcino becomes a DOC wine, and a year later, its own Consortium is founded. In 1980, it is the first wine to be branded a DOCG (Denominazione di Origine Controllata e Garantita, a guarantee of superior origin reserved to selected wines in Italy), and from that moment onward, all of its bottles are sealed with a seal of the State that guarantees their origin. 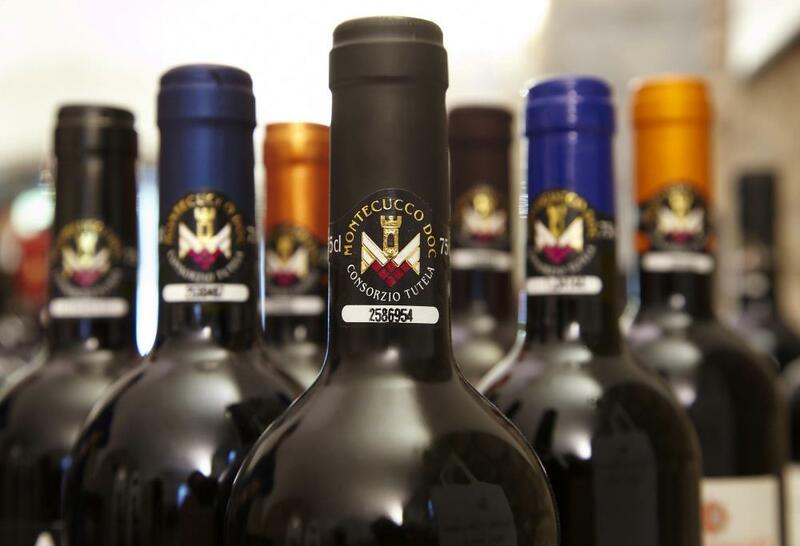 The Consortium of the Brunello of Montalcino Wine was founded in 1967, on the morn of its being branded a D.O.C. wine, as a free association between winemakers bent on safeguarding their wine and on accentuating its qualities. It represents the 100% of the enterprises producing Brunello wine. The Consortium has favored the onset of a productive fabric made of old and new, small and large winemaking firms alike, brought together by the common interest of respecting nature and aspiring to the highest quality of wine. The Chianti Classico territory’s capitals are Siena and Florence and it is shared between the provinces of the two municipalities. The zone amounts to 70,000 hectares (172,900 acres) and includes the entire territories of the municipalities of Castellina in Chianti, Gaiole in Chianti, Greve in Chianti and Radda in Chianti and parts of those of Barberino Val d’Elsa, Castelnuovo Berardenga, Poggibonsi, San Casciano Val di Pesa and Tavarnelle Val di Pesa. The Chianti area is mainly covered with woodlands, principally oak, chestnut and pine as well as cypress, situated on a plateau at altitudes between 200 and 800 metres. 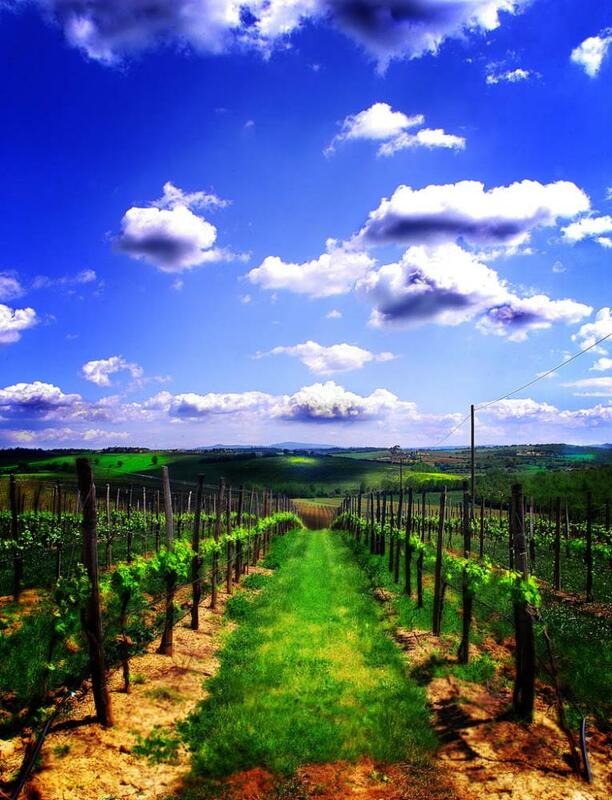 The highest altitude for growing grapes for Chianti Classico wine is 700 metres a.s.l. The local climate is continental with significant day-night temperature variation, generally low winter temperatures – below 4-5°C – and hot, dry summers, often reaching temperatures of over 35°. Geologically the land is a shield of clayey schists (marl), with layers of scaly clay, alberese and fine limestone sandstone. The dark brown soil tends not to be deep, with structures ranging from clayey-sand to stony with average clay content. 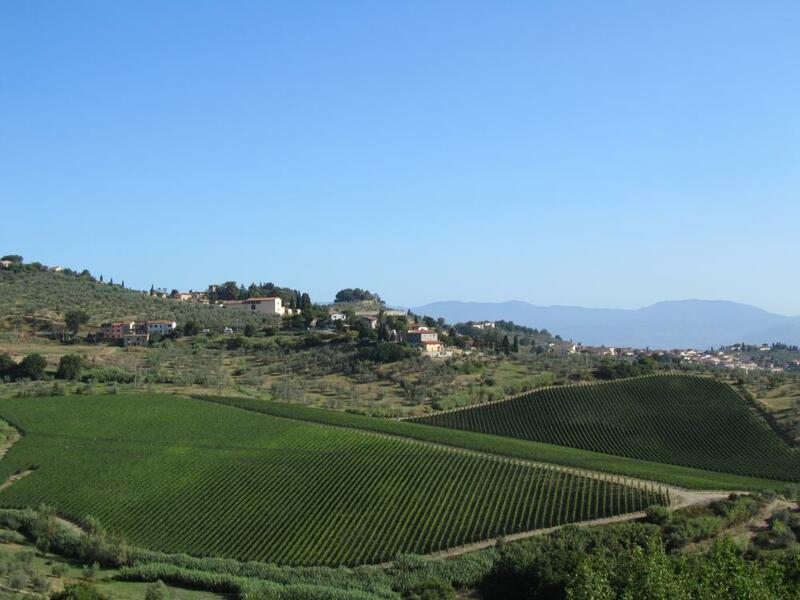 The type of land varies considerably from one area to another, making it impossible to make a clear subdivision of the various soil types typical of Chianti. But it can also be said that marl-based soil is widespread in the San Casciano in Val di Pesa, while Greve in Chianti and all the lower altitude areas have typically clayey limestone soil; large sandstone rocks characterize the Monte dei Chianti ridge; alberese is the principal element of the central-southern area, and tuffstone rock is found in most of the Castelnuovo Berardenga area. The area with a marked sandstone presence are severe and steep while the limestone hills are softer and rounder, and the clayey hills are even gentler. Almost all the Chianti Classico production area, though, has soil rich in stony material, especially marl. Two-thirds of the whole area is covered with woods. Oak trees are present everywhere while chestnuts are found mainly in the eastern area, conifers in the higher altitudes and pine woods in the lower hills south of Florence. This is the birthplace of one the best-known and most widely appreciated wines in the world, guaranteed by the Denominazione di Origine Controllata e Garantita (DOCG) certification which is the peak of the quality scale for Italian wines. Chianti Classico, with its distinctive and unmistakeable trademark, the Black Rooster, is governed by production specifications which include a minimum of 80% Sangiovese grapes in the blend for this, the only “oldest zone of origin”, defined in its boundaries in 1716 by an edict issued by Cosimo III, Grand Duke of Tuscany. 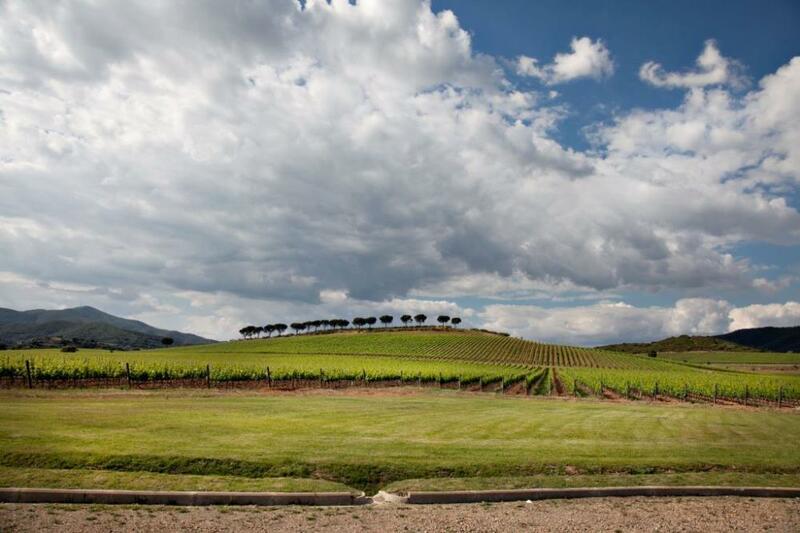 From its foundation the Consortium has been protecting, overseeing and valorizing the Chianti Classico denomination. 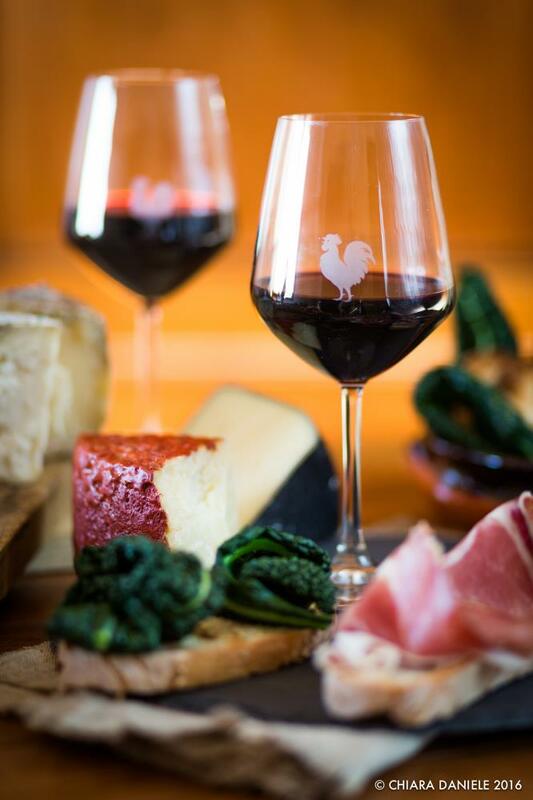 From the Consortium for the protection of Chianti wine and its mark of origin of the 1924 to today’s Consorzio Vino Chianti Classico the organization has changed its name and the design of its logo, but its trademark has always been the historic symbol of the Black Rooster. 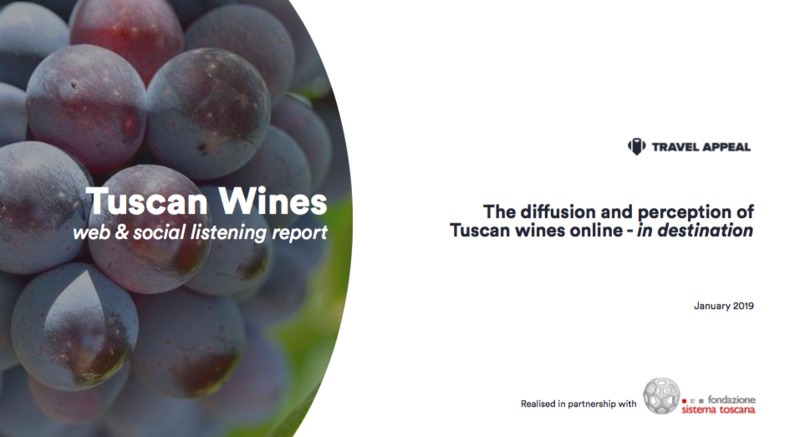 Consortium, which represents nearly 96% of the DOCG production, is one of the principal representative for the institutional organizations in Italy and in the European Union in the grape-growing and winemaking sector. It is internally organized into different departments performing its official tasks: safeguarding the denomination, valorizing the brand and providing a variety of services to its members. 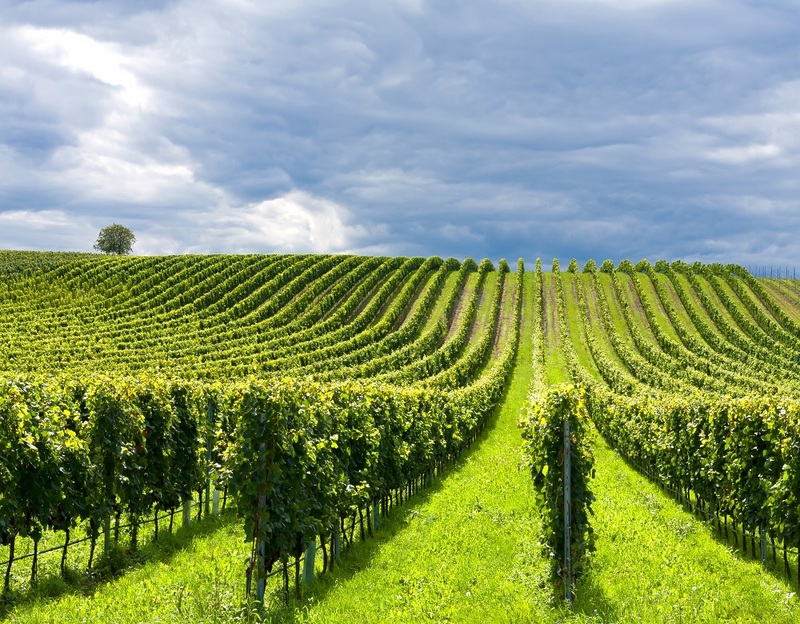 The entire production chain, from grape growing to wine bottling, is supervised by a tracking system the data of which are entered into a public database. This system enables consumers all over the world to check the bottle they’ve purchased only by surfing the www.chianticlassico.com website. The Consortium also closely monitors its wines on the market.Another important part of its activities consists of research and development in the agronomic and enological fields, in collaboration with prestigious educational and research institutes. 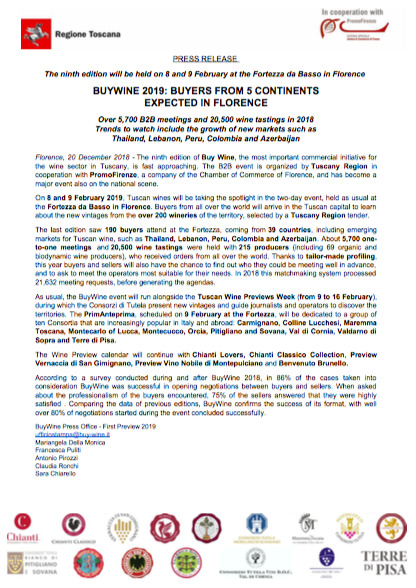 After the issue of the European Community CMO (Common Market Organization) on wine, Italy passed a decree that replaced the former law on denominations of origin so that now organizations with a high degree of representation of a denomination can act for all their wineries to valorize the denomination and its trademark. Consortia for protection that represent at least 66% of the denomination and 40% of its wineries are therefore permitted to manage all control, protection and valorization work, reinforcing their roles. In addition, the new law enables a consortium with these requirements to define policies to drive the offer in order to safeguard and protect product quality and help to better coordinate how the denomination is put on the market. Morellino di Scansano became a Denominazione di Origine Controllata e Garantita (DOCG) recognized wine starting with the 2007 harvest. The addition of the “garantita” to the title which was bestowed on the Consortium in 1978, DOC, is the fruit of the labor of 200 producers and growers over the last 30 years in order to reach an exceptional level of quality at every stage of wine production. In order to conform to traceability standards, the Consortium is now using the State seal instead of the one that was previously used by the Consortium starting in 2004. Chianti Rufina is one of the highest-quality wine production zones of Tuscany and certainly the highest in elevation and coolest in terms of climate. The production of high-quality wines was so well established here that the area was included in the decree of Cosimo III de’ Medici, who in 1716 saw the need to protect, from counterfeiting, Tuscan wines being produced in Chianti, Pomino, Carmignano, and here in Valdarno di Sopra. Over the course of the 19th and 20th centuries, the wines produced in the Sieve area were progressively given the designation of Chianti, initially in a generic fashion, and finally with the designation of the subzone Rufina. The same thing occurred with Carmignano, which regained its own name only in the 1960s, and with Valdarno di Sopra, where the preferred designation for wines was the term Chianti Colli Aretini. The growing area lies in north-eastern Tuscany and includes the piedmont zone in the Sieve valley, an area of high hills and low and medium-high mountains. Both the environment and its wine production are absolutely unique in Tuscany. Its distinctive ecological and climatic conditions make possible a perfect equilibrium among vineyards, olive groves, ands woods of fir and chestnut. Soils are mainly sandstone- and marl-based, thus containing a preponderance of silica and mica, and very little presence of clay, and with abundant pebble and gravel admixture in the higher sections. Crops are grown up to as high as 750 metres. During a good part of the year, the climate in the growing zone is temperate and cold, in summer the Mediterranean sphere make its influence felt, which significantly impacts the final stages of the grape-ripening process, making it possible for the fruit to achieve optimal ripeness. A clarification is necessary at this point regarding the extent of the territory of Pomino. Comparing the boundaries of the areas specified in the 1716 decree with those of the present DOC zones, one can see that the decree’s Pomino zone comprised a large part of today’s Rufina and Pomino. For Chianti Rufina, the regulations specify 70 to 100% Sangiovese, and among the other allowed grapes, use of white grapes may not exceed 10%, and Cabernet Franc and Cabernet Sauvignon may not exceed 15%. The wine may not be released before 1 September of the year followed the harvest. 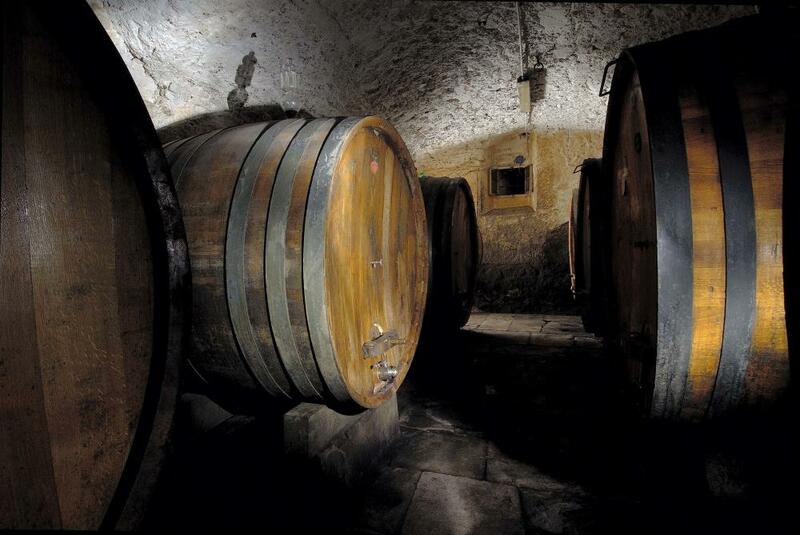 Use of the designation Riserva requires a minimum of 2 years’ maturation, of which 6 months must be in oak barrels. Viticulture in the Pomino DOC, on the other hand, bears the particular influence, from the mid-1800s, of Vittorio degli Albizi, who was a member of that noble Florentine family but was born in Auxerre and lived many years in France. His contribution was to have introduced French varieties into this area: Chardonnay, Pinot bianco, Pinot Grigio, Cabernet Sauvignon, Cabernet Franc, Merlot, Malbec, Pinot Noir, and Syrah. The current Production Code requires that Pomino Bianco (including late-harvest and Riserva) be made from Pinot Bianco, Pinot Grigio, and Chardonnay; Pomino Vin Santo from the white grapes and with Trebbiano allowed as well; Pomino Rosso (Riserva and late-harvest as well) and Vin Santo Occhio di Pernice from Sangiovese (minimum 50%), Pinot Noir, and Merlot. Produced in addition are Pomino Chardonnay, Pomino Sauvignon, Pomino Pinot Nero (Pinot Noir), and Pomino Merlot—all with minimums of 85% of the referenced grape variety. There are also a Pomino Spumante (sparkling wine), both white and rosé, based on Chardonnay, Pinot Bianco, and Pinot Noir. Pomino Rosso must be aged at least six months in large oak ovals (botti), while the Riserva needs a minimum of two years, of which at least 12 months must be in botti or oak casks, and a further three months in the bottle. At Carmignano, wines have been produced through the centuries, from the Roman era to Medieval times, through the Renaissance to the modern epoch. Cosimo the 3rd de' Medici issued an edict in the year 1716 which is the first example of the delimitation of an area for a DOC denomination, concerning Carmignano, Chianti Classico, Chianti Rufina-Pomino and Valdarno di Sopra are now-adays well recognised DOCG and DOC areas which, in the year 2016 attained 300 years of denomination status. The local name, at Carmignano, for Cabernet Franc and Sauvignon grapes, is “Uva Francesca”, or French Grapes. It is told that Catherine de Medici, queen of France in the sixteenth century, was the one to have imported the first cuttings of this vine. Later, Cosimo III sent his enologists to Bordeaux to perfect their knowledge of this particular vine, which then became widely cultivated at Carmignano. The geographical area delimited by the DOC denomination lies within the small mountain range of Montalbano, west of Florence. The slopes, favourably exposed and of relatively modest elevation, are open to the Florence-Prato plain, allowing the area good ventilation and adequate sunlight. Moreover, the fresh winds from the nearby Appennine range, which cool the torrid summer nights, create an optimal range of temperatures for the cultivation of vines. The rain falls mainly in autumn and winter, though moisture is never lacking in the summer. Even the Arno River plays an important role on climate. The soils in the area have very different characteristics, from sandy soils of the Oligocene period, to the flaky clays with calcareous formations, or the large swathes of limestone and whitish chalky marl. In 1975, this wine won DOC status, and successively, in 1990, was one of the first among Italian wines to attain DOCG status. 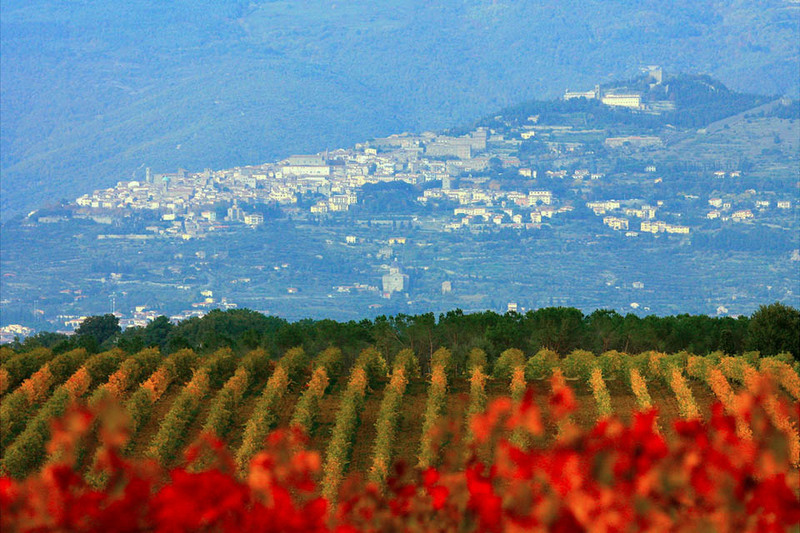 With only 200 hectares of vineyard, Carmignano is the smallest DOCG in Italy. There are another 120 ha classified IGP for a total of 320 ha. Total production in 2010 was about 5.376 hl from 16 producers, 12 of which members of the consortium. The DOCG regulation states that the composition of Carmignano wine is to be made up of: Sangiovese, making up at least 50%, Canaiolo nero, up to 20%, Cabernet Franc and Cabernet Sauvignon, from 10 to 20%, white grapes up to 10%. Furthermore, other varieties of red grapes, mainly merlot and syrah, can make play a part in the composition of the wine up to 10% of the total. Last-ly, the wine must age in oak barrels, for at least eight months in the case of Carmignano and at least twelve months where Car-mignano Riserva is concerned. Other products: Barco Reale di Carmignano, Barco Reale di Carmignano Rosato (Vin Ruspo) and Vin Santo di Carmignano. The name Barco Reale derives from the huge Medici estate which covered most of the territory around Carmignano which was enclosed by a wall, the Muro del Barco Reale, which was more than thirty miles long. 40% of the product is sold on the Italian market, the remaining 60% is sold abroad. Carmignano is sent to most of the European Union , to the Baltic countries, Sweden and Norway, to the United States, Canada, Brazil, Japan and Mexico. The Chianti production area consists of territories which are demarcated by law, located in the provinces of Arezzo, Florence, Pisa, Pistoia, Prato and Siena. This environment is characterized by hills with large terraces and valleys crossed by rivers. The origins of Chianti date back centuries but the wine received its ?rst accolades in the 19th century, the ?rst of?cial demarcation of the production area in 1932 and was granted the Registered Designation of Origin (DOC) by means of a Decree of the President of the Republic on August 9th 1967, which established the wine’s characteristics through special Production Regulations. The “Chianti” Designation can be integrated with the speci?cations of “Colli Aretini”, “Colli Fiorentini”, “Colli Senesi”, “Colline Pisane”, “Montalbano”, “Ru?na” and “Montespertoli”, the ?rst of which correspond to the geographical sub-zones in the ?rst territorial demarcation established by the Ministerial Decree dated July 31st 1932, while the last, Montespertoli, was recognized with a Decree dated September 8th 1997. In these speci?c areas, more restrictive production methods and special requisites have been established for the wines. 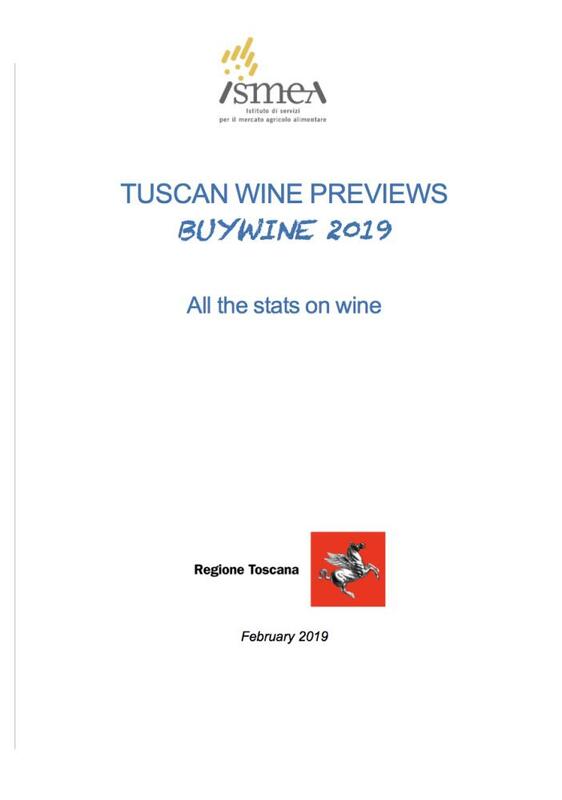 It is interesting to note the return of the “Superiore” typology which has superior characteristics and potentially refers to the whole Chianti wine district. The basic grape varieties used in the Chianti vineyard are: minimum 70% Sangiovese, additional grapes up to 30%, with a maximum of 10% for white grape varieties and 15% for Cabernets. The maximum yield of grapes per hectare, for high density plantations, is 11 tons for Chianti, 9,5 tons for Colli Aretini, Colline Pisane, Montalbano, Rù?na and Montespertoli and Chianti Superiore, 9 tons for Colli Fiorentini and Colli Senesi. Chianti wine has a ruby red color, which tends towards garnet with aging. It has a harmonious, dry, sapid, slightly tannic ?avor, with an intense, vinous aroma, as well as hints of violet. Some typologies can be consumed as young, fresh wines which are pleasant on the palate, whilst some areas are best known for their medium-long aged wines, which present a more mature color, bouquet and unmistakable ?avor. A Decree issued by the Ministry of Agricultural, Food and Forestry Policies on September 3rd 2012 granted recognition and responsibility also for valorizing, promoting and monitoring the following classi?cations: Vin Santo del Chianti and Colli dell’Etruria Centrale. The “Colli dell’Etruria Centrale” designation is positioned alongside the DOCG Chianti designation and permits the production, in the same area, of wines of a different quality from Chianti, with red wines being joined by whites, rosés, “novello” and Vin Santo. The recognition of the “Vin Santo del Chianti” designation, with the possibility of using the various sub-zones, marks an important step in the valorization of this product that represents so much for the traditional and production skills of the Chianti area and for which the Consortium has fought so long. The Consorzio Vino Chianti was established in 1927 by a group of wine producers in the provinces of Florence, Siena, Arezzo and Pistoia. 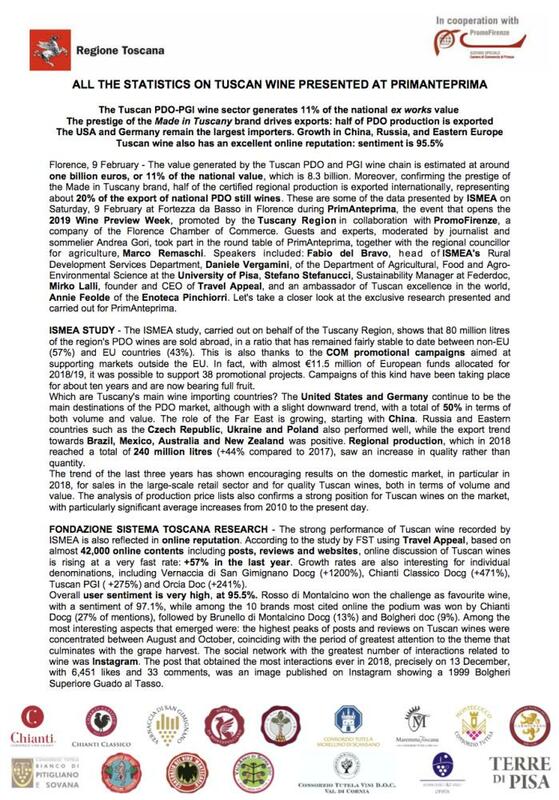 Subsequently the Consortium expanded its operations to include the whole production area recognized by the 1967 Regulations, later assimilated into the Guaranteed Registered Designation of Origin (DOCG) recognized in 1984 and updated, for the last time, with a decree dated June 19th 2009. The Consortium protects over three thousand producers, working more than 15,500 hectares of vineyard, producing in excess of 800,000 hectoliters of Chianti wine of various zones and typologies and has been attributed the “ERGA OMNES” recognition for its representative status. It’s responsible of carrying out functions regarding consumer information, protection, promotion and valorization, as well as the general care of interests related to D.O.C.G. “Chianti”, through a Decree issued by the Ministry of Agricultural, Food and Forestry Policies on September 3rd 2012 and renewed by the Ministerial Decree of September 2015. Val di Cornia valley is on the southern part of the Tuscan coast: it runs from the coast of Piombino and San Vincenzo and, through the first hills of Campiglia Marittima and Suvereto, following the river “Cornia” climbs until the higher ones of Sassetta and Monteverdi Marittimo. Even if it could be possible to speak about grape culture since etruscan age (the name “populonia” origined by the name “fufluns”, etruscna deity which corresponds to the greek one Dioniso), it was just from the ‘80s that it spurred on by a higher quality wine, wineries pledged to give birth the appellation "DOC Val di Cornia" and also their consortium. From that moment, there were some changes for the disciplinary. Now in “Val di Cornia” these wine are DOC: white, ansonica, vermentino, rose’, sangiovese, merlot, cabernet sauvignon, ciliegiolo, ansonica passito and aleatico passito. Besides these theer are also DOCG red val di cornia and docg suvereto. 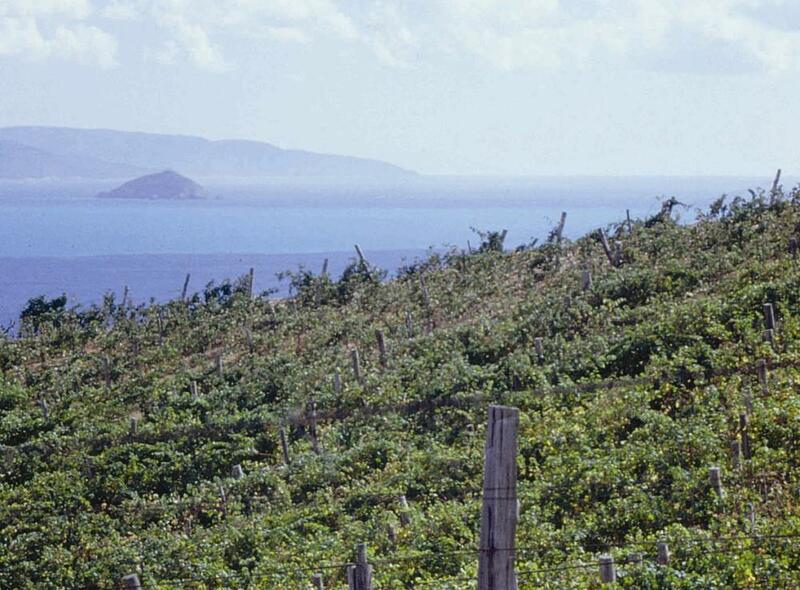 Nowadays Val di Cornia consists in more than 60 wineries and the average dimension increased from 5 ha in the ‘80 to 10-12 ha and, still remaining prevently as family-wineries, were able to organize themselves for facing the international markets. 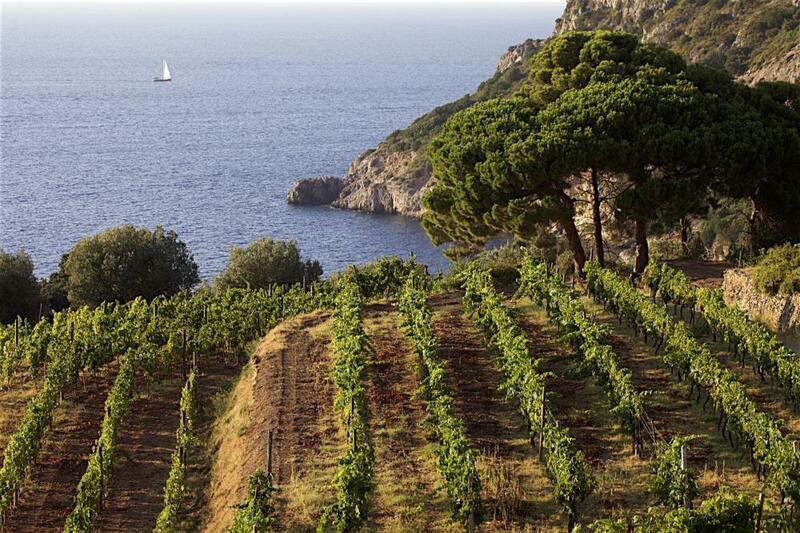 - Vineyards are mostly on (or just next to) hills, surrounded by mediterranean bush and forests. The wines, even produced in the different areas Val di Cornia has, are characterized by the high concentration (due to the low production per hectar) and, in spite of it, mantains considerable balance both for important fenolic maturity and good level of acidity and, for their richness, are extremely lasting and permit to be tasted even after many years. The consortium was born at the end of the ‘80 and very soon started his activity for promoting the wines. In these 30 years, according to improve the quality, many changes were done and were introduced international kind of grapes which, at the beginning, were not allowed. Nowadays different kinds of wine are produced and some of them are not not in the rules of our disciplinary so can easily find some IGT. The band represents the investiture that the Association recognizes to the wines that pass the severe examination of the internal Commission. Each producer member of the Association, once obtained the acknowledgment as DOC of the product, released by the Chamber of Commerce and other government supervisory organs, can freely decide to present his products to a Commission composed of Oenologists and experts. Successively these products will be tasted anonymously and if judged suitable, they will be awarded the suitability for the use of the identification band. It’s just the certainty of the quality of the approved product that pushes us to “put face”, that is to give a stamp with our logo, printed on progressively numbered bands, as a guarantee for all the consumers that choose our product. 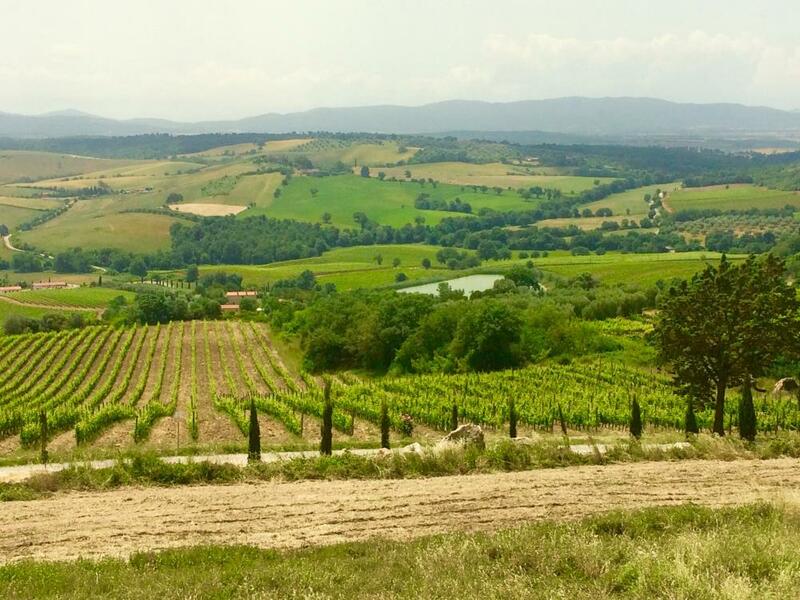 It was a group of young farmers who in 2000 created the Association for the protection and the promotion of the newborn Montecucco Appellation of Origin, stimulated by the deep conviction that only sharing a way they could obtain a real growth. Thanks to the care and to the passion that the twenty promoting partners have lavished on the Association, this one has become a guide for the territory and a centre of confrontation for the whole surrounding productive structure. 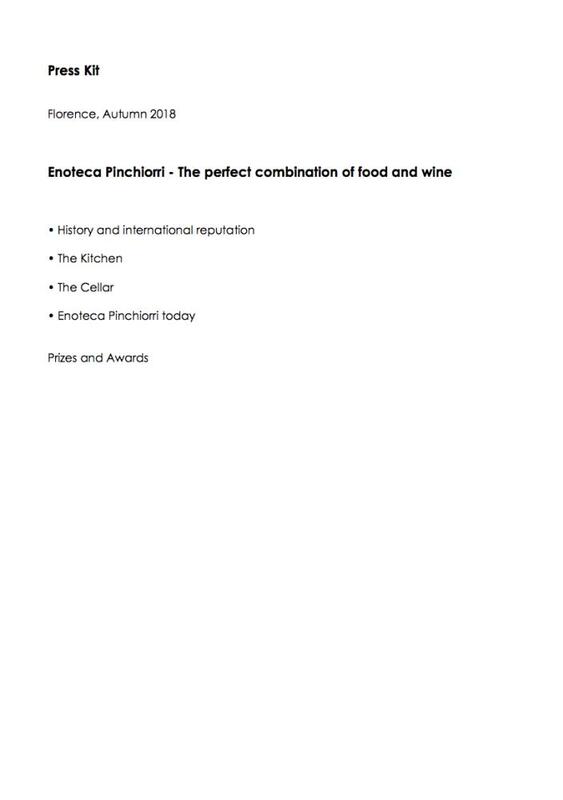 The capability to stand daily by the enterprises, the activity of promotion of the brand, the care for the quality of the product in every step of its transformation are some of the factors that have permitted to acquire the trust of the local enterprises, joined in time by some of the most important wine producing companies of the national survey. This continuous development made sure that, starting from a few dozen producers and a few thousand bottles, today the association enterprises have notably increased and they produce over one million bottles. In spite of the increase of the Appellation and the heterogeneity of the producers, there is a trait then that joins the latter: the absolute respect for the countryside and its products in an environment of full symbiosis between man and nature; in fact, whatever the enterprise dimension may be, the care for all the steps of production of the grapes is constant, in the awareness that a great wine comes above all from the vineyard. In addition of that in the cellar they use traditional and modern but never invasive techniques; all of this to give the final consumer a wine that is a sincere expression of our territory, close but at the same time far from the routes of mass tourism, still genuine, to taste, therefore fit to fascinate whoever will visit it.